Challenger Deep is located in the western Pacific about 2000 kilometers east of the Philippines. It is the deepest part of the Mariana’s Trench, which makes it the deepest part of any ocean. March 23, 1875, the British research ship H.M.S. Challenger rolled out a line with a weight on the end to measure the oceans depth, something it had been doing throughout its four year journey. It was quite a line. When the weight hit bottom, Challenger’s crew had paid out five miles of hemp — a depth of 4475 fathoms in the measurements of the day. Although cruises like the Beagle and the Endeavour had set the stage for such exploration, the Challenger expedition was rigged out specifically to study the world’s oceans beneath their surface. It essentially initiated of the science of oceanography. Our space shuttle Challenger was named after H.M.S. 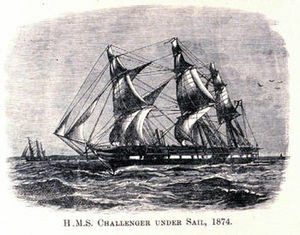 Challenger, as was the ship H.M.S. Challenger II which returned to the spot in 1951 and remeasured the depth using an echo-sounder. This time the figure was seven miles, not five. Reaching the bottom of Challenger Deep remained impossible until two world wars, submarines, frogmen, sonar, and the invention of the Aqualung wedded modern technology to oceanographic exploration. 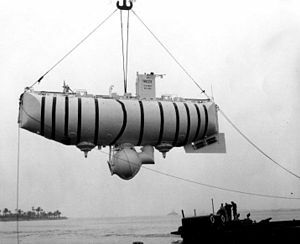 A new invention by Auguste Piccard, the bathyscaphe, finally made very deep dives possible. In its essential function, a bathyscaphe is more like a dirigible than a submarine. The crew is suspended beneath the vessel in a steel sphere designed to withstand great pressure. The skin of this pressure sphere is so thick, five inches in the case of the Trieste, that it would sink immediately. To prevent this, it is suspended beneath a large, thin skinned, self-propelled float filled with gasoline. This provides buoyancy and, since gasoline is a liquid, is not affected by pressure. Air tanks allow the bathyscaphe to float on the surface as it is being prepared for use. Once the air tanks are emptied, the negatively buoyant bathyscaphe sinks to the bottom — seven miles down in the case of Challenger Deep. The pressures there are so great that it is impossible to refill the air tanks, so the bathyscaphe also carries several tons of steel shot in open bottom containers, held in place by powerful electromagnets. When it is time to return to the surface, the electromagnets are shut off, the steel shot is released, and the now positively buoyant craft returns to the surface. In case of a power failure, the shot would automatically fall away. The bathyscaphe Trieste was built in Italy to a modification of a Belgian design by Swiss inventor Piccard for the French navy, who subsequently sold it to the American Navy, who rebuilt it with a new and stronger pressure sphere made in Germany. Globalization, anyone? On the twenty-third of January, 1960, the Trieste was ready to plumb Challenger Deep. The crew consisted of Jacques Piccard, son of the designer, and Navy Lt. Don Walsh. They boarded the vessel, moved down to the seven foot diameter pressure sphere and sealed the hatch. The air tanks were allowed to fill with water and the descent began. It took nearly five hours to sink to the bottom of the Deep. Three quarters of the way down, one of the plexiglas windows cracked, but not enough to cause disaster. As they cruised above the deep ocean floor, Piccard and Walsh reported a bottom of smooth ooze and saw bottom fish swimming, proving that vertebrate life could survive such high pressure and eternal darkness. They spent only twenty minutes at the bottom, in part because of the cracked viewport, and hours more returning to the surface. No one would return to those depths for another half century. Trivia for the faithful: Jean-Luc Picard of Star Trek: TNG seems to have been named after the Jacques Piccard, or after his father Auguste Piccard and his twin brother Jean Felix Piccard. Different sources credit different family members with the name origin. Also, in TNG episode “11001001” a small, slow starship named Trieste is mentioned. This entry was posted in A Writing Life and tagged forgotten heroes, history, military, oceans, writing on March 28, 2017 by sydlogsdon. In Heinlein’s original stories, a visionary entrepreneur named D. D. Harriman put the first man on the moon. In our world, NASA did it. Recently, NASA has been in one of its periodic slow periods and entrepreneurs like Elon Musk have been taking center stage. Just this week (I’m writing this on March second) both groups were in the news. Musk announced that two unnamed underwriters had put down sizable deposits for a trip around the moon in the near future, riding in a Dragon spacecraft on top of one of his Falcon rockets. And NASA has announced that the first launch of its Space Launch System booster might carry astronauts around the moon again, for the first time since 1972. Both are big news, if they happen. Of course, if you follow the space program, you know that there are always more big stories of upcoming events than there are actual events. We’ll have to wait and see. There are many space enthusiasts who feel that private enterprise should lead in the exploration of space. “Boy genius builds rocket in basement and travels to Alpha Centauri” has a long history in science fiction. I don’t see it. American industry built all the components of the Apollo missions, and the government paid the bill. 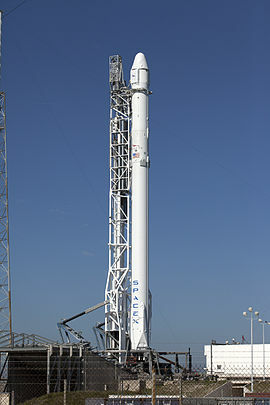 Elon Musk has built the Falcon rocket (see photo) on his own, but a NASA contract to supply the ISS pays at least part of the bill. Different, yes, but how different? Privately owned trucks carry goods to your town every day, but on government built roads. Private enterprise is always entangled with government support. Perhaps it all comes down to a case of, “Who do you trust?” Do you trust private enterprise? Or do you trust the government? Personally, I don’t trust either one of them, so I don’t care who carries the torch for space exploration, as long as it happens. All this brings us to the anniversary of the day. Since innumerable interesting things have happened throughout history, and there are only 365 days in a year, you can find something worth celebrating almost any day. On March 26 (yesterday) or March 25 — depending on which side of the international date line you’re sitting on as you read this — in 2012, James Cameron made a solo descent to the deepest point in the ocean. The Challenger Deep, in the Marianas Trench, had not been visited by humans since 1960. That expedition was sponsored by the government, specifically the U. S. Navy. Cameron’s visit was self-financed. Rich men spending their money on their passions, without regard for profit, is not just a twenty-first century phenomenon. Rockefeller made his money in oil, then set up the Rockefeller Foundation. Alfred Nobel made his fortune in armaments, then set up a Peace Prize. Andrew Carnegie made his money in railroads, then set up a chain of libraries across America, including one which illuminated my youth. Cameron became rich through such films as Titanic and Avatar. His passion for undersea exploration is of long standing. Like Musk with manned space flight, Cameron is continuing an exploration that the government began, then partially abandoned. Tomorrow we will look at earlier explorers of Challenger Deep. This entry was posted in A Writing Life and tagged oceans, science fiction, spaceflight, writing on March 27, 2017 by sydlogsdon.